Although a rainout on Friday night delayed the start of Stanford baseball’s 2016 campaign by a day, the Cardinal didn’t let the change of schedule throw them off. Stanford (2-1) swept its season-opening doubleheader on Saturday, 2-0, 2-1, before falling in Sunday’s series finale 4-3 to No. 21 Cal State Fullerton (1-2) to get its season started on a high note. A stellar collegiate debut from freshman right-hander Tristan Beck on Saturday afternoon and an outstanding start to follow that up from junior lefty Chris Castellanos on Saturday evening set the tone for the weekend, which was marked by three high-level pitchers’ duels. Although sophomore Andrew Summerville had one bad inning in Sunday’s finale, he was also dominant for stretches against a talented Cal State Fullerton lineup that combined for only 18 hits through the three games over the weekend. Especially promising was the fact that the pitching staff, which suffered from chronic control issues last season, only combined for two walks over the weekend — both in the first game of the series. The bullpen — a shaky point of last season — also made a big statement as well, with Tyler Thorne, Colton Hock and Chris Viall combining for 8.2 innings of shutout relief in which they only allowed four hits and struck out a combined 10 hitters. Marquess was also particularly proud of the fact that Stanford’s defense did not commit an error all weekend, and Stanford’s entire infield made some tremendous defensive plays over the course of the three games, highlighted by a pair of diving plays at shortstop by junior Tommy Edman. “When you play these types of teams, you can’t make many mistakes, or else they’re going to take advantage of them, because they don’t normally make mistakes,” Marquess said. When he took the mound on Saturday, Beck became just the third freshman to start Opening Day for Stanford since 1988, joining Mike Mussina and Cal Quantrill for the honor. Although he gave up a leadoff single to Josh Vargas to begin the game, Beck settled down and pitched like a veteran, allowing just one more hit through his 6.1 innings of work and retiring 11 consecutive hitters at one point before being pulled after his only walk of the afternoon with one out in the seventh to a rousing standing ovation from the Stanford faithful. Although Beck admitted after the game that he had jitters in that first inning and got off to a shaky start, Carter, who caught him, remarked that the freshman showed poise and confidence on the mound that greatly impressed him as the game progressed. Although Stanford was only able to pound out two runs against an equally impressive outing from Fullerton ace Blake Quinn, that’s all the Cardinal needed with Beck dealing. A Mikey Diekroeger home run in the fourth was followed up by a RBI single from Quinn Brodey in the seventh to set the final margin. The Cardinal followed up their impressive start in the first game of the doubleheader with another stellar performance in the nightcap, with Castellanos allowing just one run on five hits in 6.0 innings of work, supported by an RBI groundout from Jack Klein and an RBI single from Diekroeger. With just a one-run cushion to work with, Hock shut the door in a three-inning save, striking out four while not allowing a single baserunner in a perfect outing. With the Cardinal’s first season-opening series victory since 2012 already in hand, Stanford turned to Summerville in Sunday’s finale to get the job done. Although the lefty allowed the Titans to plate three runs on five consecutive hits in a shaky second inning, he buckled down and retired 10 consecutive batters at one point in his six innings of work. Meanwhile, Fullerton freshman starter Colton Eastman was almost unhittable for most of his collegiate debut, retiring the first 16 Stanford hitters he faced before finally blinking in the bottom of the sixth, when he allowed three straight hits to Beau Branton, Alex Dunlap and Edman that plated two runs. Although an error by Fullerton third baseman Jerrod Bravo on a Diekroeger grounder closed the margin to 4-3, Stanford couldn’t finish off a potential rally in the eighth and ultimately fell in the finale despite three stellar innings of relief from Viall. Diekroeger led the way for Stanford from the plate with two RBIs over the weekend, while senior right fielder Jonny Locher added a pair of doubles and freshman second baseman Nico Hoerner also added three hits and some slick defensive plays. 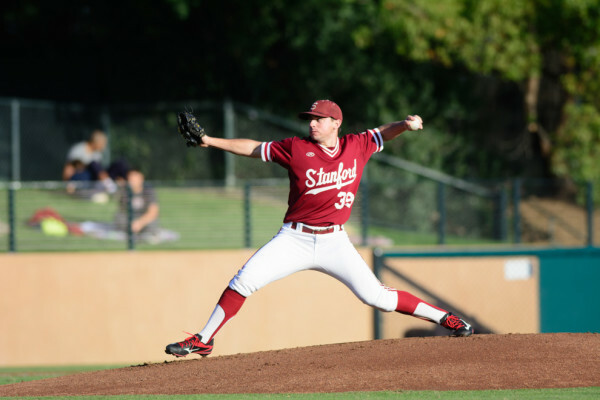 Stanford will next turn to junior Brett Hanewich on the mound as it travels to Davis to take on the UC Davis Aggies for one game today at 2 p.m. before it prepares itself for a four-game series in Austin against the Texas Longhorns.